I’m continuing to post my backdated holiday blogs. If you haven’t seen it, the latest one includes a hopefully amusing epic bus ride from Penzance to Lands End. After yesterday’s comparison at Bentleigh, here’s one showing far more change: Laverton on the Werribee line. There’s been a tremendous amount of residential growth along this line, and thankfully the number of trains has increased markedly over the last 20 years. The line opened in 1859 to Geelong, but until 1983 it was only served by country diesel trains, reflected in the older timetables that show barely any services at all in peak. For some services you had to change to an electric train at Newport to reach the City. 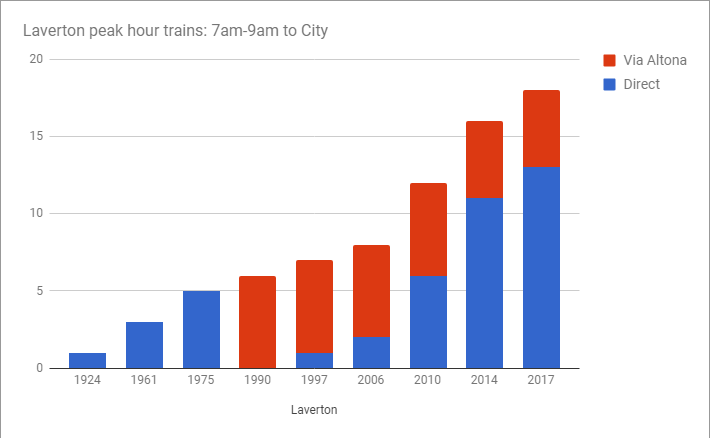 In 1985 the Altona line was extended via Westona to Laverton, forming the Altona Loop, and most Werribee trains started using it. Through the 1990s there was a train about every 20 minutes in peak, with almost all trains running via the Altona Loop — though some counter-peak trains ran direct to avoid conflicts on the single track. Off-peak until the early 90s trains were only every 40 minutes (60 in the evenings), before being upgraded to 20 (30 in the evenings) to match most of the rest of the network. Little changed until around 2006 when patronage really started to boom, and as you can see, since then the number of peak hour trains has increased markedly. The Altona Loop has well-known issues. The mostly single track means any little delay can cascade easily, so Metro frequently diverts trains off it, making an already poor frequency (mostly 20-22 minutes) even worse. In 2015 the Geelong line was diverted off the Werribee line, theoretically allowing more space for 8 more Werribee trains in the two hour peak. Since then a handful have been added; the 2017 figure (from next week) shows another small increase for those trains. Some Werribee line passengers have probably migrated to the Geelong line since then. The new Wyndham Vale and Tarneit stations are very busy, with Tarneit being the busiest V/Line station apart from Southern Cross. Is it enough? No. The 2016 passenger load survey still shows 6 Werribee line AM peak trains above the load benchmark. This is down from 8 in 2014-15, but still too high. Can they squeeze more trains onto the Werribee line in peak? Probably a few. The bottleneck will (eventually) be between Newport and the City, where the Werribee, Altona Loop and also Williamstown trains (every 20-22 minutes) all merge. The solution after that might be upgraded signalling, though by that point remaining level crossings will also be an issue. Another choke point is between North Melbourne and Flinders Street, where some trains from the Craigieburn (currently) or Sunbury (from next week) trains share the tracks, because the Loop tunnels are full. In fact, apart from switching to 6-car trains all the time, Sunday morning and weekend evening train timetables have barely changed since the 1990s. Clearly not good enough for our growing city. ← Previous Previous post: Trains in peak hour – are they increasing? There’s also an issue around 4pm where the there are plenty of passengers but only a 20 minute frequency. It’s disappointing that even with the opening of the regional rail link there’s been only a handful of services added. There’s also been a disappointing lack of level crossing removals in the west compared to the east with only 5 crossings to be removed and the time frames being 2020+ to actually begin the work. It is disappointing that the new timetable only adds one extra Werribee service to morning and afternoon peaks. The impact will be negligible at best. An added dimension of this would be to look at urban growth along the Werribee line. Go back 20 years and Laverton was an island of suburbia in the middle of empty paddocks. The contrast between the weekday and weekend timetables on the Werribee line is quite bizarre, compared to the trend on the network to run the same level of daytime service everyday (eg 10 minute services to Dandenong/Frankston). On a weekday in the new timetable there are 9 trains per hour between Newport and Flinders Street all day, but only a basic 20 minute service (3 trains) runs on a weekend. The long-term solution to track capacity between Newport, Footscray and North Melbourne is to use that link exclusively for Westona (Point Cook?) and Williamstown trains, and run Werribee (or Wyndham Vale?) through Melbourne Metro Two, running Newport – Fishermans Bend x2 – Southern Cross – Flagstaff – Parkville; the latter on an axis under Peel St & Royal Pde. From there, the line would run under Royal Pde then College Cres., then either via Johnston St (Lygon-Rathdowne and Smith-Wellington stations), curving under Victoria Park (TBM launching site?) and Clifton Hill for interchange; or via Alexandra Pde (Neill St optional) and Queens Pde (Rathdowne-Nicholson and Smith-Wellington stations). Either way the line would head towards Clifton Hill, underneath Merri Creek and then form either the Mernda or Hurstbridge line, returning to ground level in the vicinity of Northcote or Fairfield respectively. I’d also prefer that they run the morning loop pattern all day, as that seems to give the most interchange flexibility at both Richmond and Nth Melb. So irrelevant the loop reversal these days with limited stabling near the city. While I understand the weekday services are close to capacity, surely Metro and PTV can do more to increase services during the weekend. I’m sure the Altona Loop can handle 15 minute frequencies at the very least. 40 minutes frequency during parts of the weekend is just unacceptable. As with any cancellation of services through the Altona loop (usually made into an express) which also result in 40 minute wait times. The 22 minute frequencies should be replaced by 20 minute frequencies. The Werribee line should get 10 minute services in the inter-peak and weekend daytime with Newport-Footscray-North Melbourne express pattern and be fully through-routed with the Frankston trains. The Altona Loop and Williamstown line services would then form the 10 minute services for the stations run express through between Newport and North Melbourne. This however would mean taking the Werribee and Frankston lines out of the loop on the weekends, which while a goof idea is considered politically dangerous. The Werribee line also needs 3 new/revived stations: Derrimut/East Werribee (at Derrimut Rd), Paisley (at Millers Rd) and Newport West/Newport South (at Champion Rd or Maddox Rd). I attended the event at the Deakin University a few weeks ago. One of the speakers was, my very own John Hearch from the Rail Futures Institute. The Regional Rail Link, is already full during peak hour, with room for only one extra train for the whole hour. The only solution is to extend the length of trains, and you can only go up to 8 V/Locity cars without the need of expensive infrastructure works. The RRL, have taken a lot of the customers away from the Werribee line, with the Geelong line trains now functioning as more of a suburban service through Tarneit and Whyndam Vale stations. You stimulated me to have a look at the Werribee and Altona Loop timetables. I did not know that Altona Loop trains are quite separate from from Werribee trains. This is odd, as I am not sure what I imagined the Altona train to be. I have a good handle on the Altona Loop line now. As per tweets from Jennifer Williams, I really don’t understand why such an isolated line as the Altona train is, is so often cancelled. It is certainly a poor service on that line. I also had a look at the Alamein Line, comparing the old train timetable to the new, and nothing seems to have changed. Here’s a crazy idea – replace the Altona loop with a BRT to Newport, and maybe on into the city. (I’m a convert to BRT even though we havnt got a single one in Melb yet). Because – the Altona line can never have too many more trains without a total rebuild because it’s a single track with multiple level crossings serving a small isolated suburb that’s not going to grow much (with three stations!). Serving it properly by building double track and routing all Werribee trains through it (which is the only sensible way to serve it) could only be done with a skyrail, which would be quite expensive, especially if it had three elevated stations, and require a bit of compulsory acquisition, not to mention that Altona people probably wouldn’t like the idea. So, a BRT could run along the rail reserve within Altona, with three simple ‘stations’, then adjacent to the Werribee line, then a flyover near champion rd (when will that level crossing get removed?) then dedicated lanes along south side of market st to the bus interchange at Newport. This service would be not quite as fast as the train (traffic light priority within Altona would help) but more to the point it could be v frequent, like every 10 minutes, and cost far less, never get cancelled, and mean Werribee trains just all go to Werribee (and beyond in the future), so less congestion from having three services all merging at Newport. That would provide a service like now, but more reliable, maybe in total more frequent given that trains through Newport should/will be more frequent, but presumably a one vehicle trip to Footscray or the city would be better than having to change – but to be fast to Footscray, it’d have to flyover somehow through Newport to Douglas Parade/Hyde St.
To go on into the city actually looks like a good idea, even given slow traffic up Melbourne road and the freeway / bridge – google maps tells me that it takes less time to drive from Southern Cross bus depot to Altona station than the current 2 trains ! With part as BRT lanes, and express from Newport to the city, it’d be much faster than current train, even allowing the stop at Newport. Okay I take all that back – the easier adn cheaper solution is to delete the Altona loop altogether, rather than spend a lot of $ to serve a population of 10,000, when for instance Altona Meadows next door has no train service and has a population of 20,000. Far easier to do what Tom says more or less – a new ‘Altona’ station at say Maidstone Street, with all the ramps and lifts you could want, and lots of carparking (so much room there !) and preferably an Altona shuttle bus that goes down the former rail reserve, and meets the trains; preferably all of them all the time. I did not suggest closing the Altona Loop. Reviving Paisley station would be mainly for Altona North passengers and some Brooklyn passengers. Some Altona passengers would use it, for reasons such as express trains and frequency (especially once Werribee goes to every 10 minutes inter-peak and weekend daytime, although the current government not continuing the roll out of 10 minute services is slowing this down) and reliability, however most would continue to use the Altona Loop.